Over the weekend, after gorging down all that food from the gourmet food trail, I went to attend a birthday celebration at Ascott Singapore where the girls get trained to become good housewives. *giggles*. Practically, we have to prepare dinner about 10 people. Anyway, during the houswife training camp session, I’ve learnt several great,easy recipes from other housewives-to-be. Michelle’s easy-to-make burritos wowed me. How on earth could a burrito, a staple food for the mexicans and spanish, taste as good as this? 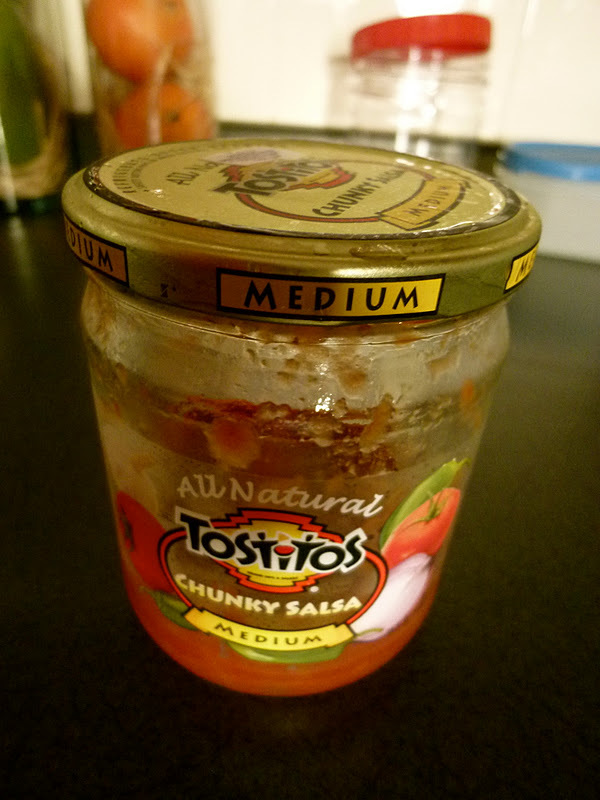 The secret to this recipe lies in this jar of salsa. Without this, the burrito wouldn’t taste half as good. Remember, we going for a healthy choice here. So, purchase anything that starts with the word, ” Wholegrain” or “wholemeal”. 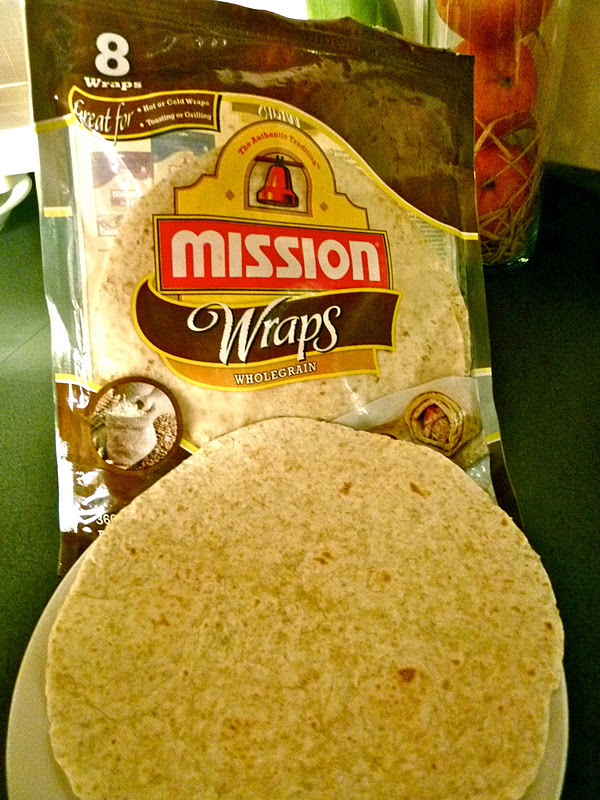 Step 1: Whip out a fresh tortilla wrap from the packaging. You may want to toast it in the oven for 2 to 3 minutes to give warm it up and tp give it more crisp. Try swirling the tortilla with your index finger but don’t overdo it as it may end up like a flying saucer that was flung away and you would not be able to retrieve it back. Step 2: Slap some ham, chicken,beef or any carnivorous meat on the tortilla wrap. 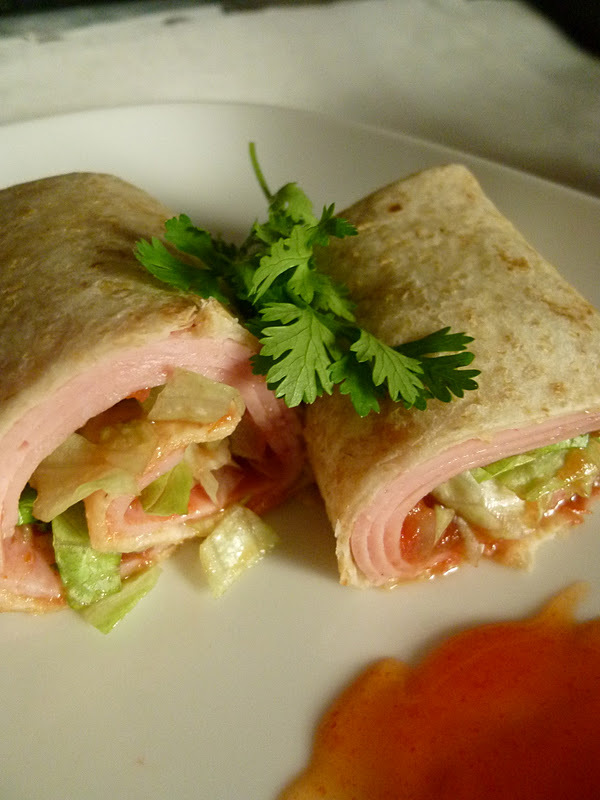 I choose ham because it’s something thin and flexible which makes it easier for wrapping. Step 2: Add two tablespoons of salsa and spread it over the ham. You may top it up with some lettuce, grated cheese or other greens. Step 3: This is the fun part – wrapping the burrito. Just in case you might be wondering, those fingers you see weren’t part of my body. Those were my mum’s. Very soon, she will be appearing my blog post, I hope. Step 4: Roll it away. Salsa away with your burrito! Skip the sandwich, grab a burrito instead.